Delhi Laser clinic, a leading skin care and laser clinic in Dwarka, New delhi. We offer laser hair removal treatment and all other skin care treatments. When we talk about the don’ts and do’s of skin care, many things have to be taken into consideration and have to be controlled. For instance, makeup must be removed before going to bed or hand soap mustn’t be used on the face etc. Skin being the most important organ of the body needs vital care. 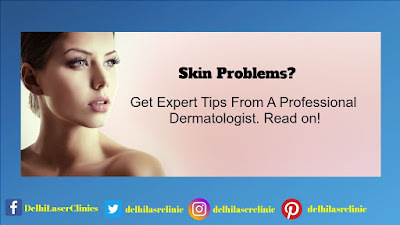 You need to know some proper tips and tricks so that you don’t fall prey to skin diseases. Delve a bit deep and discover your dermis. Given below are some important things that you need to follow. There are many who claim to be skin experts. However, it’s important to find the best dermatologist in Dwarka who has completed her training properly. If there are any doubts, the specialization certificate must be seen. People must avoid spa facials and high street facials because it might tend to cause many breakouts, rosacea or acne. Studies have shown that breakouts are aggravated owing to these facials. Only medical grade facials are recommended. We have heard a lot about the role of diet in skin care. People should surely consider the effects of the same on the skin. Many people don’t know that a good and healthy diet will keep the skin shiny and glowing. If proper diet is taken, aging can be controlled to a great extent. We have heard a lot about stress and aging. Often, people overlook the side-effects of stress. Meditation can help in this. Even cortisol levels can be controlled. This is indeed a key to control the process of aging. This is infact a wonderful addition to the skin care routine of the people, true for people of polluted cities. Pollution left-overs in the pores are cleared and it’s 100 percent better than manual cleansing. People who are having inflamed pimples or spots should definitely avoid using it. It’s important to do mole checks time and again; go to a good dermatologist and get it checked. Going once a year is totally fine. The skin must be self-examined once a year. Skin checks can be performed at home too. Many people have that assumption that rich and thick creams are good for skin that’s sensitive. However it is not always right. The skin care products must be tailored as per the condition and type of the skin. Dermatologist’s advice should be considered. A dermatologist having a specialization in skincare and dermatology must be contacted. People who suffer from acne start the treatments but are not patient enough to wait for results. this must be avoided. With time, everything is healed well. Dr. S. K. Kashyap Pant is the best dermatologist in Dwarka and he can give some expert tips for maintaining your skincare regime. Visit Delhi Laser Clinic now itself.